Audiobook Week question of the day: When do you listen to audiobooks? As with many others, audiobooks have been a life-saver for me when it comes to housework. Audiobook ON--germs are still there, but who cares? Mr. Darcy is proposing to Elizabeth! Isn't this one of the cutest buttons you've ever seen? I think so. It makes me happy just to look at it. Jen's Audiobook Week topic for the day is "How to write an audiobook review." As I said, I usually add information that I would personally want to know about. Is there anything I haven't covered that you would want to know before trying out an audiobook? 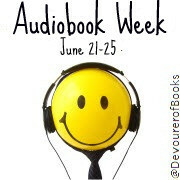 This post is part of Audiobook Week hosted by Devourer of Books. Audiobook listeners of course come from all walks of life, but my own experiences are unquestionably shaped by my lifestyle. In fact it is my SAHM-ish-ness that drove me to audiobooks, much like a commuter who is looking to fill the repetitive, monotonous drive with something more meaningful. It's a way to feel like you're moving forward, rather than stuck on a virtual treadmill, whether it be tracked in miles or loads of laundry folded. And it makes the time seem to fly rather than remain grounded like the inch of dust hiding under my couch. 1. If at first you don't succeed, try, try again. The first few times I tried listening to an audiobook, I just couldn't do it. My mind wandered and I only picked up about 25% of what was going on. So I gave up. A few years later I decided to try again. 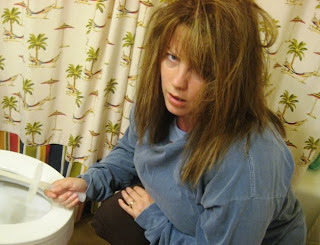 I don't remember why--I guess Oprah just wasn't doing it for me. This time I put forth all the effort my brain could muster to focus on the words (Do or do not! There is no try!) and it just took a couple of books and it became second nature. Obviously, I've never looked back. Thank you, Yoda. 2. You can't judge a book by it's cover, but you can judge an audiobook by its narrator. If you don't like the narrator's voice, turn it off! Go directly to the library to take it back! Do not pass Go!! Do not collect $200! It's not worth it to ruin a book by getting this horrid voice in your head that will never go away. 3. Slow and steady wins the race. One advantage of audiobooks over printed books is that they force me to slow down and savor each word. As with most readers, my personal pace is quicker than a read-aloud pace. This might sound like a frustrating disadvantage, but I'm generally in no hurry to finish a book (regardless of the fact that my TBR list grows exponentially by the minute). It has helped me to slow down in my regular reading, and sometimes I even find myself hearing a foreign accent in my head while I read. A bit weird, but I like the effect! 4. Those who forget the past space out during the past track are condemned to repeat it. Although I am a pretty good listener these days, there are times when my mind wanders, or the sound of the garbage disposal drowns out the narrator's voice, or my daughter comes to show me her collection of pencil shavings. Basically, the rewind button is my friend! 5. Never forget a name. This could just be me, but I do still have a hard time with keeping track of names while listening to an audiobook. I remedy this by either writing down the names as I come to them in the first hour or so of the book, or looking up a list of characters on the internet. For some reason I need to see names in print, or they just don't stick. This goes for people I meet in real life as well. I've tried to take notes on entire audiobooks before, but more often than not, my hands are covered in soap bubbles or bread dough residue, so writing is difficult. 6. To each his own. Audiobooks aren't for everyone, and far be it from me to suggest that everyone should listen. The only thing I have a problem with is when people say that listening to audiobooks does not count as proper reading. My only response to this is "Huh?" "But will you tell me, now that you know I ask in friendship, were you born blind, Orrec? Or those witches you told me of, from Cordemant, did they do this to you, in spite, or a feud, or a raid?" I did not know how to put his question aside, and had no half-answers for it. "No," I said. "My father sealed my eyes." "Your father! Your father blinded you?" 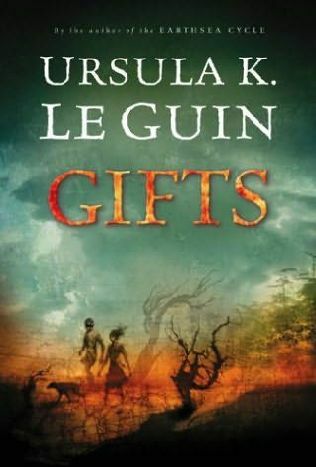 Young Orrec of the bleak Uplands is deprived of his sight when his father tells him that his hereditary "gift," the power of undoing, is a wild one--not subject to his will. Orrec is terrified his power will harm those he loves, and so he submits to being blindfolded until he can gain control. Even without the ability to use his gift, others in his small community as well as rival families look upon him with fear and awe, which his father uses to his advantage. While Orrec goes through periods of frustration, grief, and self-doubt, he gradually discovers other avenues his gift may take, and he feels hope that he may be able to take control of his own life, and find happiness with the girl he loves. Le Guin's writing is so striking to me. It has a certain beautiful melancholy to it that draws me in. 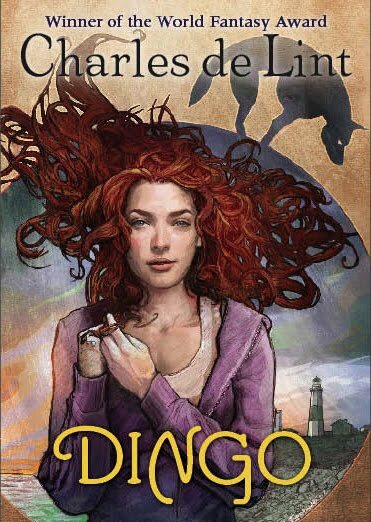 The descriptions of the landscape and the culture, and the emotional experiences of the characters, are almost more compelling than the story itself, which is sort of static and meandering, but in a good, gentle way. I enjoyed it a bit more than A Wizard of Earthsea, but the themes are somewhat similar--analyzing the nature of power and finding a balance between creation and destruction. And, yes indeed, this is the beginning of a series, which seems to be my gift/curse these days--unknowingly picking up series-starters. Gifts is followed by Voices and Powers and all three comprise Annals of the Western Shore. I think they will make perfect summer reading! At long last I have finally entered the revered world of Charles de Lint. He is an author that I have heard raved about, and it has taken me far too long to find out for myself what all the fuss is about. My pick was random--what was available at the library among a few others. I'll admit the hair caught my eye. And the lighthouse in the background. It looked promising. The story is told by Miguel, a senior in high school who meets the beautiful and captivating Lainey while working the counter at his dad's comic book shop. Lainey, and her unusual looking dog, have just moved to Miguel's lakeside town from Australia, and Miguel feels an instant connection with her. He senses she is in danger, and when he starts having vivid dreams that seem all-too-real that confirm his fears, he wants to help her. Events are set in motion that will test Miguel's view of the world he lives in, as well as his notions of honor and friendship. And of course he hopes to get the girl in the end. I don't even think I have hit on de Lint's finest, but I am still impressed. What a great storyteller! The real world and the fantasy world are so subtly intertwined that disbelief is almost effortlessly suspended. Miguel's character is so refreshing--he's funny, empathetic, and he loves and respects his father. Throughout the story, he almost always tells his father what's going on and asks him for help. I was so glad the de Lint did not at all rely on characters not "telling the whole story" to create tension. It didn't need it, and sometimes I get tired of plots that depend on this tactic. If there's a literary term for this, I'd love to know! Overall story was uplifting and humorous, and lived up to my "cover expectations." I'm ready for more de Lint. Any suggestions? Prude-ometer (highly subjective content assessment): Language, innuendo, reference to sexual situations but nothing explicit. None of it detracted from my enjoyment of the story, but it might be offensive to some. It's a familiar tale for many. A lovely girl accepts a punishment meant for her father, and makes her way to an enchanted castle inhabited by a hideous beast. Waited on by invisible servants and invited to dine with the beast nightly, she gradually overcomes her fears and a deep friendship blossoms. When she becomes homesick, the beast allows her to return home for a week, but warns her that if she doesn't come back, he will die. When his death becomes a very real possibility, her true feelings surface as she desperately tries to save him. There have been many variations of Beauty and the Beast through the years, and although this seems to be a fairly faithful retelling, the details McKinley adds to embellish the tale so beautifully enrich the story and give it a satisfying depth. I especially loved that our heroine grows into her beauty. She is introduced as a hard-working, practical girl who sees herself as anything but beautiful, and her name seems something of a joke. She's a bookworm with a love of the classics and a dream of furthering her education in ways unthinkable for a young woman of the time. Her character is written in such a way that she is selfless without being overly submissive. Her beauty comes to her gradually without her even realizing it. I like the way that love changes not only the beast, but Beauty as well. 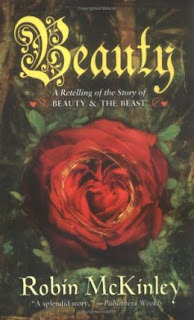 One would assume a fairy tale retelling would be "enchanting." While Beauty had its share of magical moments, what struck me most was how "real" it felt. Almost down-to-earth, despite the miracle-grow roses and generous gifts appearing out of nowhere and the like. I'm not sure how exactly to describe it, but I felt it was a perfect mood to create for this particular love story. Pages for lists of reviews by author and title. Yay! This is what I really wanted to get done. It took about 12 hours, with some glitches here and there, but I now have listed links for 173 books that have been reviewed on my blog since November of 2007. Email subscription option, for those so inclined. Completed six mini-challenges. Thank you challenge hosts! I learned so many new things this weekend. Visited lots of new-to-me blogs. I didn't keep close track, but I probably left around 50 comments here and there. Did some real-life stuff. In the midst of the Bloggiesta, I was in a dance recital of all things, and we got a huge new freezer that I can stockpile with freeze ahead meals! My body sort of quits around 3 or 4 o'clock each day, so when I have a dinner made ahead, we're all a lot happier. I didn't even get to my "secret" list. One thing on that list that I've wanted to do for a long time is design a header. I'm just learning how to use GIMP, so it could be a long process as I figure out what I'm doing and then design something I'm pleased with. Maybe next time I'll be ready! All in all, I logged in about 24 hours for the Bloggiesta, which was way more than I had planned. When I woke up this morning, I had almost 900 items in Google Reader (not all book blogs, but still a little scary). I almost never hit "Mark all as read," (it's a compulsive thing), but I had to do so on some of my categories this morning for sanity's sake. Put an RSS icon that linked to your feed and another for your email option. Add the RSS feed to your header so your browser auto-detects the feed. I believe I've covered all these, learned a lot, and set up an email option for the first time. Muy bueno! One mini-challenge: Hosted by Kim and Jackie at the Blog Improvement Project. There were a few very informative links that served as a springboard for me to explore new territory and learn new some new vocab. I have a lot more territory to cover. Reviews by title and author: I can see this will take a while, so it's good that it was my only goal listed! I don't even think I'll get to my "secret" list. Maybe I'll save it for next time. Visits: Spent a couple of hours visiting other participants' blogs, which only scratched the surface. I haven't spent too much time on Twitter. Today I've got a few hours to work and then it's off to a dance recital and a birthday party. Food: I did have my taquitos for lunch! But then I went all multicultural and had Chinese for dinner. Maybe I'll have a burrito for breakfast to keep things in a proper balance. 1. Make links for reviews by title and author--I have no idea how long this will take, but I like it when blogs have this and I've always wanted to add my own. I don't even know yet how many book reviews I've done over the last few years. And I also have a SECRET list. Things I want to get done but may not actually have the skills to do. So if I fail, no one will know about it. I don't know how much time I'll actually have this weekend (June 11-13), but I don't want to miss out on the fiesta! Head on over to Maw Books Blog if you haven't heard about this event dedicated to spiffing up your blog. It's also a good excuse to down an excessive amount of taquitos, but that may just be me. I'll write out my to-do list tomorrow at the starting line. Heavens to Murgatroyd! Being twelve can be tough! Franny feels virtually invisible. Her history teacher repeatedly passes her by when it's her turn to read. Her college-aged sister leaves for a week without bothering to tell her why. And the boy-of-her-dreams down the street won't notice her if ex-friend Margie has anything to do with it. Sometimes, though, it would be nice to be invisible. Like when her Uncle Otts is trapped in World War I memories and tries to get the neighborhood kids to "fall in line" as they run away in fear of the "crazy" old man. What puts Franny's life a notch above the usual preteen woes is that it is the year 1962, at the time of the Cuban Missile Crisis. Air-raid drills, bomb shelter blueprints and the threat of nuclear war all occupy Franny's thoughts as she tries to compose a letter to Chairman Khrushchev pleading for peace. But despite all the fear and uncertainty that surrounds her, she still has to figure out what she wants to be for Halloween. 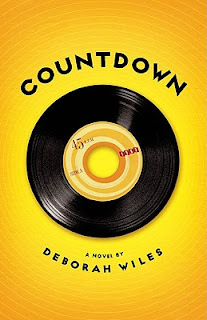 Aside from the fresh approach to historical fiction, Countdown is a pleasing story that had me turning the pages until I was through. Franny is a likable character whose own experiences parallel the increasing tension of the Cold War, and I appreciated being able to look at the events of the early 60's from different angles. It seems that many of the books I've been reading lately have sequels, and this one is no exception. Countdown is actually the first of a trilogy. For the record, I will eagerly anticipate Book Two, which, according to Wiles' blog, she is currently writing. She also has an iMix on her blog of songs and clips of speeches that are highlighted in the book that you can enter to win here through July 1. Sadly, I have no iAnything to download it to. I'm so behind the times--no wonder I loved a book about the sixties. What a wonderful 48 hours! I've learned that sometimes I'm in the zone for these readathons, and sometimes I'm not. This time it was exactly what my brain wanted to do! Not that my numbers are overly impressive--another thing I've learned is that I'm not good at keeping track of time, especially towards the end. I'm not really in it for the stats anyway, I just love setting aside a block of time exclusively for reading. I listened to a couple of hours of Guests of the Ayatallah by Mark Bowden, and started The Adoration of Jenna Fox by Mary E. Pearson. My 15-year-old daughter also finished My Lost and Found Life by Melody Bowsher. I'm looking forward to doing more visiting in the coming week to find out how everyone did and what great books are recommended. Oh, and I suppose I should do some reviews. It's good timing for the Bloggiesta coming up next weekend, June 11-13. I'm not sure if I will be able to participate yet, but I am hoping to! I have a lot of little tasks I would like to accomplish, and this event makes it fun. 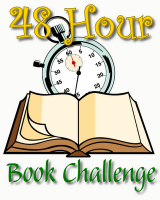 *For the 48 Hour Book Challenge, we will be donating to Love 146, an organization my daughter heard about at her high school that she has become involved with. 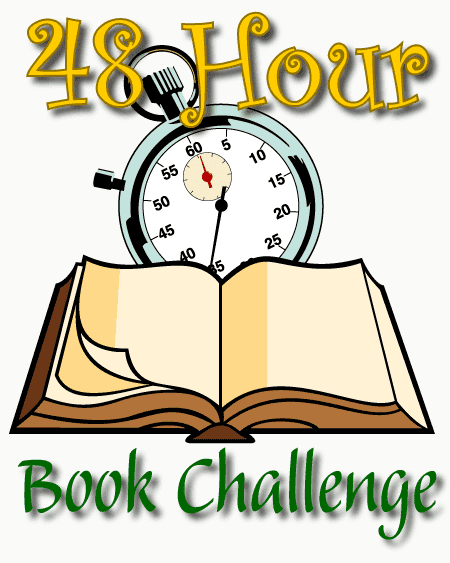 As I sneeze and sniffle this lovely Friday morning, I am ready to begin the 48 Hour Book Challenge hosted by MotherReader. (If you want to join in, it's not too late!). My chosen 48-hour block sits between 9 a.m today and 9 a.m Sunday. I'm not reading continuously or anything--I am after all human and I have various events to attend the next couple of days. But I am looking forward to reading A LOT, and I'm excited to read several children's and YA books that I've wanted to get to for a while (out of the 30 I check out of the library. I couldn't help myself.) I will attempt to tweet, but I'm not sure when I'll do updates on this blog. Maybe just when I feel like it. Have fun, those of you who are participating!